During the cold, dark days of January and February, my mind turns to sunny, bright red tomatoes—for this is the time to start them indoors. The growing season in most parts of the country isn’t long enough for gardeners to start these plants from seed outdoors. But you can start tomatoes indoors fairly easily, and in so doing, provide yourself a welcome reminder that spring will soon be on its way. More choice in variety. There are hundreds of varieties of tomatoes. Garden centers, however, can only stock so many starter plants, and for obvious reasons, they’re usually the hardiest varieties. You can order seeds of less common and heirloom varieties by mail. Less chance of disease. 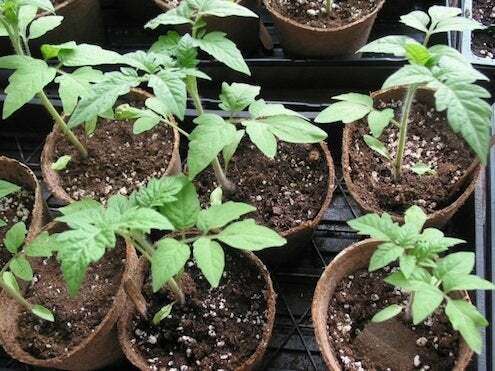 When you start seeds yourself, you control the environment, so there’s less opportunity for disease to spread to your tomatoes from other plants, as can happen in large greenhouses. Cultivation of your favorites. When you find a variety you love that works well in your garden, you can keep a good thing going by saving your seeds from last year’s harvest. You’ll save money, and you’ll know exactly what you’re getting. 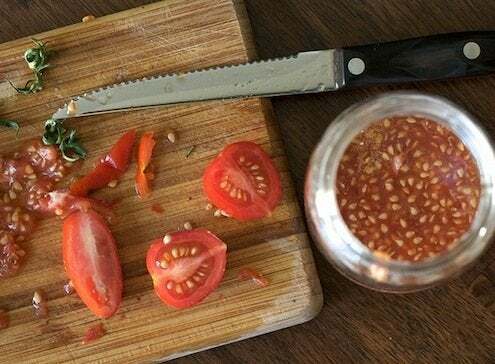 Just remove the seeds from a tomato, rinse them, and let them air dry on a paper towel for a few days. Then seal the seeds in an envelope labeled with the variety, storing it in a cool, dark place until it’s time to start the seeds. 1. Prepare Your Containers. Dampen your potting soil and fill your containers until they are about one inch from the top. 2. Plant Your Seeds. 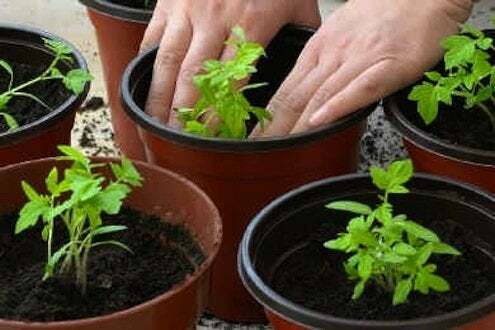 With your pinky finger, poke two or three holes in the soil of each container. Drop a seed in each hole and lightly sprinkle with potting mix to cover. Lightly pat the soil over the seeds and if it’s not moist enough, spritz with water. Label the container or place a label in the soil, moving the container to the sunniest spot you’ve got. 3. Cover Your Seeds. You can create a greenhouse effect by wrapping your containers lightly with plastic wrap. Remove the wrap when your seedlings poke through the soil. 4. Care for Your Seedlings. Keep the soil moist and rotate your containers if the plants begin to bend in one direction or the other. Once your plants have a set of “true leaves”—usually it’s the second set—you can feed once a week with a liquid fertilizer diluted to half-strength. 5. Repot Your Seedlings. When your plants have at least two sets of true leaves and are about three inches tall, you can repot into larger container, making sure there is only one plant per container. 6. Harden. To ready your plants for the outdoors, you need to “harden” them with some wind and cooler temperatures. To accomplish this, put a fan on your plants for an hour a day or set them outside for an hour once temperatures reach above 50 degrees. Alternatively, you can jiggle your plants, or sweep them with your hand, as you pass by several times a day. 7. Transplant. Transplant seedlings outdoors once the danger of frost has passed and nighttime temperatures are consistently 50 degrees or above. If you plant your tomatoes all the way up to their first set of leaves, more roots will grow off that stem under the ground, making the plant sturdier. There is something so satisfying about watching tomatoes mature after planting them from seed, and somehow they taste even better. One thing is for sure, though: You’ll hate having to buy tomatoes in the grocery store come autumn. But if you save some seeds from your harvest, you’ll have the excitement of starting a new crop again mid-winter.